I guess I have a thing for back-of-the-box pound cake recipes because here’s another one. This time it’s from the package of Adams Extract Pound Cake Flavor Extract. Yes, pound cake flavored extract exists! 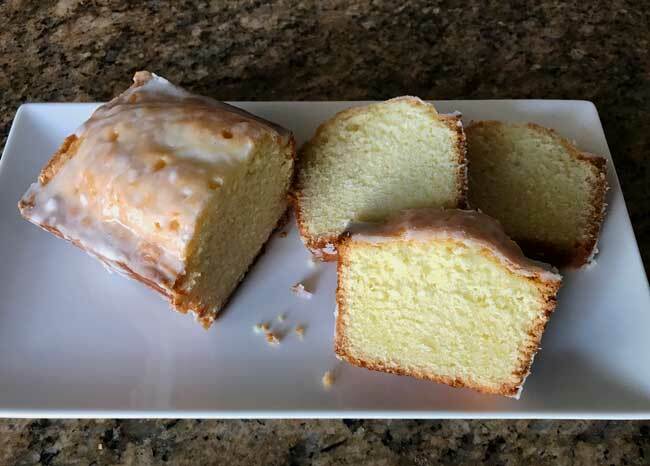 According to Adams, it’s a mix of vanilla, butter and lemon — the three flavors used in a 1965 Texas State Fair award winning pound cake recipe. You can see that old recipe here. The updated recipe for Adams Prize Winning Pound Cake now appears on the back of the Pound Cake Flavor Extract box. It’s a smaller cake designed for a loaf pan, and of course it calls for the new extract which combines all three flavors. 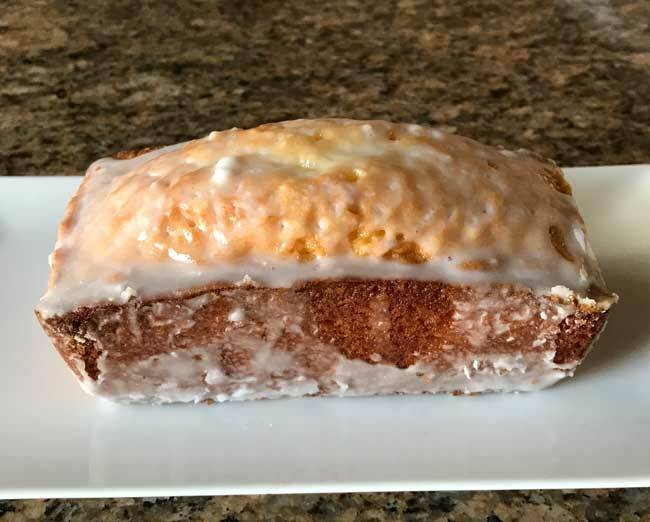 The recipe is a good one and I’m glad my husband brought home the special pound cake flavoring, but I think this cake would be perfect with just a blend of vanilla and lemon extract and maybe a dash of butter extract if you happen to have some. It has a smooth, tight crumbed texture, is very moist (thanks to the glaze) and slices neatly. You can make it as one loaf or divide it into 4 small loaves. It’s perfect served with fruit and whipped cream or all by itself since it has a flavorful glaze. Along with baking one cake, I tested it in small Wilton loaf pans and the cakes baked up perfectly in about 45 minutes. At this point, I almost like the small loaves better because they are just as moist as the large loaf and a little easier to share. 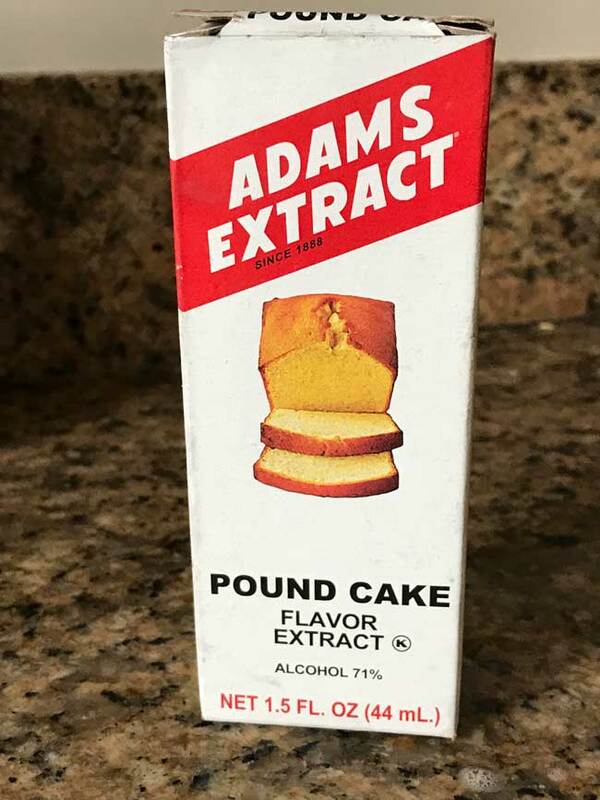 Adams Extract Pound Cake is a simple pound cake flavored with Adams Pound Cake Flavoring. Preheat the oven to 325 degrees F. Grease and flour a 9x5 inch loaf pan or use 4 3x5 inch loaf pans. With an electric mixer, beat the butter until creamy. Gradually add the sugar (1/3 cup at a time) beating well. Continue beating butter and sugar until fluffy. Reduce speed to low and add 1 egg. Mix on low until egg is fully blended, then increase speed and beat for 30 seconds. Repeat with remaining eggs, adding individual eggs on low and increasing speed. Beat in the flavoring and the salt. Mix together the flour and the baking powder, then add to the batter and stir on low until fully blended. Spoon batter into the pan and bake for about 60 minutes or until a tester inserted comes out clean. If making small loaves, bake time should be about 45 minutes. Let cool in pan for 30 minutes, loosening it slightly from the sides while cooling. To make glaze, combine sugar and flavoring, then add milk teaspoons at a time, stirring until creamy and smooth. Drizzle over cake in pan. Allow the glaze to set somewhat, then remove from pan. This recipe will also make 4 small pound cakes. 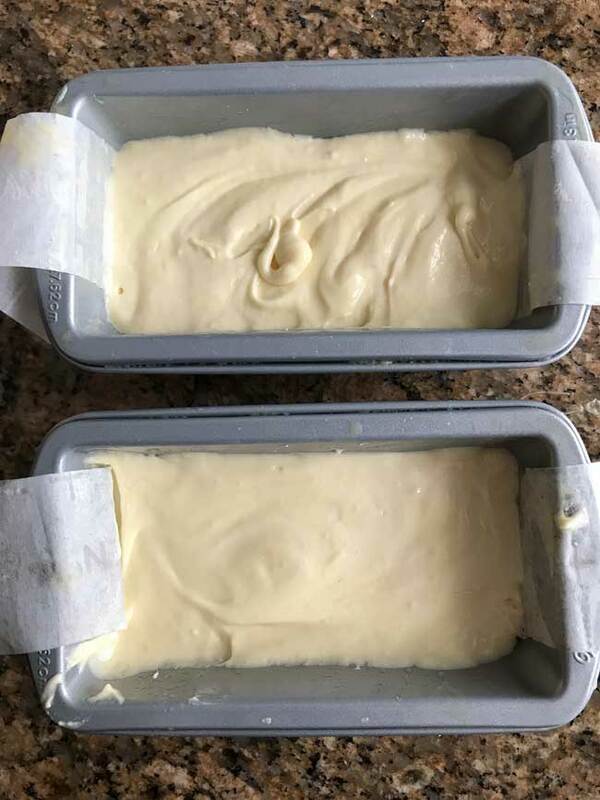 If you make small pound cakes, check the baking time after 35 minutes. If you are using White Lily, weigh out 190 grams, as the volume of White Lily sometimes differs from regular all-purpose. I've been making my test cakes with 190 grams of White Lily. Too funny! I bet your not missing these 100+ degree days though. Brian, I am a bit homesick. In other news, I ordered a new product from Nielsen Massey called lemon paste and plan on testing this same recipe with it. You could also try to duplicate the flavor by using 1 teaspoon each of vanilla, lemon and butter extract. Good luck! Even if you don’t use the special flavoring, the recipe makes a good cake. Hi, I cannot find this extract anywhere! I live in the Dallas area so if you could give me some ideas I would appreciate it. If I cannot find it, what do you suggest to come close to the flavor? That is fascinating! The extract box looks kind of retro 1965! Did Todd bring that back from Texas? Should I have my friend from Dallas look for it? I’m going to see her in August. She could be my mule. This extract combo reminds me of a tip I came across in the comments section of another cake recipe which suggested combining vanilla, orange, lemon and a little almond extract to get a sugar cookie type flavor. The cake disappeared before I could taste it so guess it was good.